December 7, 2014: Cambridge, MA. Master Class in Horton Technique, 12-2 PM. The Dance Complex, 536 Massachusetts Avenue, Cambridge, MA 02139. November 22, 2014: Huntington Beach, CA. Huntington Academy of Dance, Master Class in Horton Technique, accompanied by Eric Ruskin. November 18 - 21, 2014: Los Angeles, CA. The Trudl Zipper Dance Institute at The Colburn School, Master Classes in Horton Technique. November 17 - 20, 2014: Santa Ana, CA. Orange County School of the Arts, Repertoire Residency, Ancestors. September 8-14, 2014: Santa Ana, CA. Orange County School of the Arts / Repertoire Residency, Ancestors, and Master Classes in Horton Technique. August 24, 2014: Lecce, Italy. Palazzo Baronale di Monteroni, Sogno fra Sacro e Profano, a collaborative concert with Enzo Fina, Alessandro Girasoli, and Vox Danza Teatro del Salento, with guests Maurizio Ria, contrabasso, and Sabrina Luciani, harp. August 21, 2014: San Pancrazio Salentino, Italy. Master Class at Centro Danza Excelsior. August 20, 2014: San Pancrazio Salentino, Italy. Sogno fra Sacro e Profano, a collaborative concert with Enzo Fina, Alessandro Girasoliand artists of Salento, including the premiere performance of Vox Danza Teatro del Salento, with Carmen Garcia-Lafuente, Alissa Ianne, Cecilia Leo,and Michela Sacquegna. At Masseria Mazzetta. May 10, 2014: Los Angeles, CA. The Trudl Zipper Dance Institute at The Colburn School, Annual Spring Dance Concert. Students perform Ancestors, Fimmine, Mvt. I, and Fiori, Fiori. March 24, 2014: Little Rock, AR. American College Dance Festival 2014 South Conference Gala Concert, at University of Arkansas, Little Rock. Irvine Valley College students perform Ancestors. January 10 - March 28, 2014: Pavullo nel Frignano, Italy. Technique & Workshop for Performance, Montecuccoli Middle School. November 20 - 23, 2013: Long Beach, CA. Residency at CSULB (California State University/Long Beach). Dance Department undergraduates perform Fimmine, Mvt. III. November 22, 2013: Los Angeles. Sarah performs Stabat Mater, Mvt. III, at the Colburn School's Fall Faculty Concert. Music by Alessandro Girasoli. August 13, 2013: Salice Salentino, Italy. Il Sogno Continua, the second annual incarnation of live music, dance, and improvisation, in collaboration with Alessandro Girasoli & Enzo Fina. With guests Anna Alexandru and Carmen Garcia. Leggi l'articolo, read the article. At FucinAsud, via Cairoli 89, Salice Salentino (LE). 9:00 PM, gratis. July 26, 2013: Alto Jonio Dance Festival, Calabria, Italy. Stage di repertorio e tecnica Lester Horton, e spettacolo. Sarah Swenson performs la sua opera Campane, con musica di Alessandro Girasoli. Horton Technique and repertory workshop, followed by a performance of her work, Campane, with music by Alessandro Girasoli. July 22, 2013: San Pancrazio, Italy. Lucia Morleo Scuola di Danza, classi di danza moderna tecnica per la gioventù. Classes in modern dance technique for youth. June 14-17, 2013: Aurillac, France. La Manufacture. Sarah Swenson in residence, tecnica e repertorio. June 8, 2013: Pavullo nel Frignano, Italy. Sarah Swenson incontra l'arte di Luigi Tagliavini,Palazzo Ducale, Pavullo nel Frignano (MO): 18:00 ore. Gratis. Solo works with choreography by Sarah Swenson and music by Alessandro Girasoli. May 29, 2013: A Spring Fundraiser Performance for Vox Dance Theatre, with musical guests Enzo Fina & Roberto Catalano of Musicántica. Join us for a festive evening with live music, dance, and singing! With dance artists Tamsin Carlson, Jaclyn Kriewall, Sadie Yarrington, Monica Mordaunt, and Sarah Swenson. Vox presents the new Campane Suite with music by Alessandro Girasoli. In The Colburn School's Grand Rehearsal Hall, 200 South Grand Avenue (2nd floor), Los Angeles. Doors open at 7:00 PM. Thanks for supporting Vox Dance Theatre! Bring a friend! November 3, 2012: San Bernardino Valley College, with Enzo Fina & Roberto Catalano of Musicántica. United States premiere of Brigantesse. SBVC Auditorium, 701 South Mount Vernon Ave, San Bernardino, CA 92410. September 27, 2012: Scripps College. Richardson Dance Studio, 1030 Columbia Ave, Claremont, CA 91711, 7:00 PM. September 21, 2012: Performing Arts Exchange Juried Showcase at 8:25 PM: Colony Theatre, 1040 Lincoln Road, Miami Beach, Florida, 33139. Free. Conference Booth #412. July 9-25, 2012: Classical Modern Series 2012. $15 per class or $75 package for all six. At the Gallery Studio of Japanese American Cultural & Community Center, 244 South San Pedro, Los Angeles, 90012. Vox Dance Theatre hosts the second year of intensive Classical Modern Dance classes for students, teachers, and teachers-to-be, with six Southern California Master Teachers of modern dance. The Series offers technique, methodology, history, teaching approaches for all ages, and fundamental tenets of a variety of early and mid-20th century techniques: Trina Parks - Dunham, John Pennington - Lewitzky, Karen Safrit - Nikolais, Sarah Swenson - Horton, Diana MacNeil - Lewitzky, Tamsin Carlson - Cunningham. June 3, 2012: Vox Dance Theatre in the world premiere of Al Noor at The Geffen Contemporary at MOCA, with choreography by Sarah Swenson and music by Carl Stone. Al Noor will be performed amidst the Sky Ladder installation of Chinese artist Cai Guo-Qiang, including his gunpowder murals, crop circle installation, and videos. View this fascinating video of Cai's explosion art. The Geffen: 152 N Central Avenue, Los Angeles, CA 90013. Two performances: 1:30 and 2:30 with pre-peformance workshops for children. April 14, 2012: Vox Dance Theatre at the Los Angeles Dance Festival. Diavolo Dance Theater, 616 Moulton Avenue, Los Angeles, CA 90031, 7:30 PM. January 8, 2012: APAP 2012. Pentacle.org Gallery Roster Showcase, 8:48 PM. Jacqueline Kennedy Onassis High School, 120 West 46 Street, New York City, 10036. Free. October 20-23, 2011: Festival de Octubre. Instituto de Cultura de Baja California, Mexico. Thursday, October 20: Teatro de la Ciudad de Ensenada, Ensenada, 8:00 PM. Read the review by Marcela Danemann in Spanish: La Ventana. Friday, October 21: Teatro Universitario Rubén Vizcaíno Valencia UABC, Tijuana, 8:00 PM. Saturday, October 22: Universidad Autónoma de Baja California/Escuela de Artes Tecate, 7:00 PM. Read the review by Ruben in Spanish: Enfoke Journal. Sunday, October 23: Teatro del Estado, Mexicali, 8:00 PM. October 16, 2011: World Festival of Sacred Music and the Japanese American Cultural & Community Center present Mare Vaporum (Sea of Vapour) at the JACCC Plaza, 244 S. San Pedro Street, Los Angeles, CA 90012. Vox Dance Theater performs Fimmine in Kimono, with an appearance by students of The Colburn School in Artistic Director, Sarah Swenson's teen work, Pavane for an Iraqi Girl, 8:00 PM. June 7 - July 28, 2011: Summer Nights Classical Modern Dance Educational Series, sponsored by Vox Dance Theatre. Featuring these noble Master Teachers of the Los Angeles area: Trina Parks, Katherine Dunham Technique; Susan McLain, Martha Graham-based Technique; Diana MacNeil, Bella Lewitzky Technique; Jeff Slayton, Viola Farber Technique; John Pennington, Bella Lewitzky technique; Tamsin Carlson, Merce Cunningham technique; Sharon Kinney, Paul Taylor-based technique. Friday, May 20, 2011: Herbert Zipper Concert Hall, 200 South Grand Avenue, Los Angeles, CA 90012. 7:30 PM. Free. Vox Dance Theatre in excerpts from Auriga. Saturday, April 16, 2011: 24th Street Theatre, 1:00 PM. 1117 West 24th Street, Los Angeles, CA 90007-1725. $7. Vox Dance Theatre and Musicantica present excerpts from the new Brigantesse as well as two movements from the acclaimed Fimmine. With participation by children of the 24th Street Theatre community! Click here to buy tickets online: 24th Street Theatre. More information: (213) 745-6516. Sunday, January 9, 2011: 3:00 PM - Ailey Citigroup Theater, Jodi Kaplan & Associates Boutique Roster Showcase. Saturday, January 8, 2011: 10:30 PM - City Center Theater, Studio 5. Saturday, January 8, 2011: 9:30 PM - City Center Theater, Studio 5. Saturday, January 8, 2011: 6:30 PM - Ailey Citigroup Theater, Jodi Kaplan & Associates Boutique Roster Showcase. Friday, January 7, 2011: 8:25 PM - City Center Theater, Studio 4. August 31, 2010: WAA - Western Arts Alliance - 2010 Conference, Long Beach, CA, Affiliated Dance Showcase at 10:40 PM in the Beacon Ballroom of the Hyatt Regency Long Beach Hotel. Vox Dance Theatre is on the Boutique Roster of Jodi Kaplan & Associates / Booking Dance, WAA Booth #538. August 17-22, 2010: Edinburgh Festival Fringe 2010, Scotland. At Venue 150 with Jodi Kaplan/Booking Dance Showcase, 150 Morrison Street, Edinburgh. 4:00 PM daily, plus 12:30 PM lunchtime show on 8/18. April 18, 2010: Pentacle.org and Help Desk/L.A. presents An Afternoon of L.A. Contemporary Dance. Vox Dance Theatre performs excerpts from Auriga, with music from Hindemith's The Four Temperaments, alongside colleagues Catch Me Bird, CONTRA-TIEMPO, Donna Sternberg & Dancers, Flamenco Los Angeles, Flora Weigmann, Keith Glassman Dance & Performance, Kenneth Walker Dance Project, Rebecca Alson-Milkman, and Regina Klenjoski Dance Company. 2:00 PM at Highways Performance Space, 1651 18th Street, Santa Monica, CA 90404-3807. Reserve tickets: 310-315-1459 or buy tickets online. October 3, 2009: Dancing Beyond Borders: Dancers For Life 15/AIDS Benefit. Vox Dance Theatre premieres Auriga, with music from Hindemith's The Four Temperaments. Also on the program: BARE Dance Company, Justine Lemos, Lineage Dance, Lux Boreal Danza Contemporánea, Palindrome Performance Group, Pennington Dance Group, and Stephanie Gilliland. At Riverside City College - Landis Performing Arts Center, directions. 6:30 PM silent auction & pre-concert reception, 8:00 PM curtain. Tickets: $15 general, $10 student, senior, RCC staff. Box Office: 951.222.8100. August 23, 2009: Thirteenth Annual Celebrate Dance Festival, Balboa Park, San Diego. Vox Dance Theatre performs the complete Fimmine, Sunday night at 7:30, Casa del Prado Theater. Free! Also on the program - PGK Project and Eveoke Dance Theatre. Read the review: San Diego Arts Online. June 6, 2009: Vox Dance Theatre appears in A Tribute to Rudy Perez at The Intimate Theatre, CSULA Luckman Fine Arts Complex, 8:30 PM. Cuatro, re-dedicated to Rudy Perez for his 80th birthday, will be performed. Buy tickets: Luckman Fine Arts. Read the review: Dance Magazine Online. May 9, 2009: A Celebration of Dance: Benefit for Everybody Dance! & Gabriela Charter School. Vox Dance Theatre performs an excerpt from Fimmine with students from Everybody Dance! At the Eli & Edith Broad Stage, 1310 Eleventh Street, Santa Monica 90401. Everybody Dance! March 22, 2009: Vox Dance Theatre at 2009 Brand Library Dance Series. 2:00 PM - Free!! Performance to include a preview of the new work Auriga, as well as favorites Inventory, with choreography by Jeff Slayton, and Fimmine. Q & A and garden reception to follow. 1601 W Mountain Street, Glendale, CA 91201. December 13, 2008: Vox Dance Theatre at ArtBash 2008! A festival from the heart of LA’s arts community to celebrate the worst financial crash since 1929. 8:00 PM. $20 admission, $10 open bar access. At the Architecture + Design Museum, 5900 Wilshire Blvd. (across from LACMA) Buy tickets online. Also on the program: LA Contemporary Dance Co • The Original L.A. Breakers • Invertigo Dance Theatre • Browse performers. October 5, 2008: Vox Dance Theatre performs Jeff Slayton's Inventory, at Long Beach's annual University by the Sea Festival. In the solarium of the Cooper Arms Hotel, 455 East Ocean Boulevard, Long Beach, CA 90802 - 5:00 PM - Free!!! June 7-8, 2008: Vox Dance Theatre premieres Jeff Slayton's Inventory, with music by percussion artist Tatsuya Kakatani. The program is shared with artists Colleen Dunagan, Sue Hogan, and Erin Mitchell, producers of the Tri-Coastal Dance Project. At the Martha B. Knoebel Dance Theatre in Long Beach. Reservations and information: 562.985.7040 or cdunagan@csulb.edu. September 15-16, 2007: Vox Dance Theatre & The Lloyd Rodgers Group ~ Live in Concert. VDT's 2007 Season. Saturday, 9/15 at 8:00 PM, and Sunday 9/16 at 2:00 PM. Martha B. Knoebel Dance Theater, Atherton Street between Bellflower Blvd. & Palo Verde Avenue, Long Beach, CA, 90804. Information and reservations: 562.438.1796. November 5, 2006: Los Angeles Central Library, 630 W. 5th Street Los Angeles, CA 90071. 213.228.7000. 12 PM. September 7, 2006: WAA - Western Arts Alliance Conference, Long Beach, CA. Dance Showcase at the Rainbow Tent, 7:30 PM. WAA Exhibit Booth No. 610. September 17-18: Pennington Dance Group & Vox Dance Theatre in Concert, Long Beach, CA. John Pennington and Sarah Swenson, Artistic Directors, with lighting design by Andrew N. Milhan. An evening of new and repertory work, with choreography by Sarah Swenson, John Pennington, and Guest Choreographer Jeff Slayton. Supported in part by the California State University/Long Beach Department of Dance. August 13-14: 15th Annual fFIDA International Dance Festival, Toronto, Ontario, Canada. Vox Dance Theatre launches the world premiere of Fimmine, choreography by Sarah Swenson. Music by Philip Glass, Concerto for Violin & Orchestra. June 13: A preview performance of Fimmine, the complete work, Santa Monica, CA. Choreography by Sarah Swenson, performed by Sarah Swenson & Vox Dance Theatre. June 5: Los Angeles Dance Invitational, Los Angeles, CA. EVENT CANCELLED. Sarah Swenson & Vox Dance Theatre invited to perform Fimmine, choreography by Sarah Swenson. April 2: A Fundraiser for Vox Dance Theatre, Santa Monica, CA. Vox Dance Theatre performs Fimmine,a work in progress, choreography by Sarah Swenson. With a special solo performance by Guest Artist Simone Forti. January 14-15: The First Annual Los Angeles Dance Improvisation Festival. Performing 3 x 2 x1, an improvisation with dancers Mary Herzog and Kirk Andrews, and musician Norman Beede. November 12-14: Fourth Annual Southern California Contemporary Dance Festival (SOLA), Torrance, CA. Sarah Swenson & Vox Dance Theatre perform Ancestors: Graham, Humphrey, Horton, Taylor, Limon, Ailey & Balanchine, choreography by Sarah Swenson (2000). Music by Philip Glass, Symphony No. 3, Movement III. November 6: Seventh Annual Festival Under the Stars, Palm Desert, CA. Professional Division finalist, Sarah Swenson & Vox Dance Theatre perform Ancestors, choreography by Sarah Swenson (2000). Music by Philip Glass, Symphony No. 3, Movement III. October 17: Simone Forti: a rain or shine backyard performance at Beyond Baroque Literary Arts Center, Venice, CA. Performing Huddle, choreography by Simone Forti (1961). October 9: The Tender Land: A Festival of Art, History, Music, and Science, Pasadena, CA. Performing DoublePlay a tribute to Gertrude Stein (premiere), with the Rudy Perez Performance Ensemble and guests. Choreographed & Directed by Rudy Perez, with additional choreography by Stefan Fabry; Soundscore by Jeff Boynton; Strawn Bovee, dramaturge. April 20: Missouri Valley College Performing Arts Concert, Marshall MO. Choreography by Sarah Swenson (premieres): Rapture, music by Pat Metheny, Electric Counterpoint, fast; Move, music by The Notwist, Instrumental; Amazing Grace, music by Hubert Laws, traditional; Girl Thunder, music by Meredith Monk, Panda Chant II. Performed by the Missouri Valley College Repertory Ensemble, Sarah Swenson, Artistic Director. April 6: Missouri Valley College Performing Arts Faculty Concert, Marshall MO. Premiering Gotham Lullaby, choreographed and performed by Sarah Swenson (2004). Music by Meredith Monk, Gotham Lullaby. March 11: Music & Culture of Southern Italy with Musicantica: Enzo Fina & Roberto Catalano of Los Angeles, at Missouri Valley College, Marshall, MO. Performing Donna Ci Stai Alle Cammare (traditional Salentinian song), choreography by Sarah Swenson. January 16: Mystical Music of the Middle East, in concert with the Yuval Ron Ensemble of Los Angeles, at Missouri Valley College, Marshall, MO. Performing Volor Molor (traditional Armenian song), choreography by Sarah Swenson. November 9: The Fifteenth Annual Rooms Dance Festival, Tel Aviv, Israel. Amos Hetz, Founder. Performing In E with Common Action Improvisation, Dana Hirsch, Artistic Director. Music by Terry Riley, In C.
September 6: Trinity Episcopal Church Rose Window Concert, Los Angeles. Curated by Terence Luke Johnson. Benefitting community outreach. Performing You & I,choreographed and performed by Sarah Swenson & Dana Hirsch. April 15: Missouri Valley College Performing Arts Concert, Marshall MO. Choreography by Sarah Swenson (premieres): Peace Movement, music by John Adams, Alleged Dances; War Movement, music by Darren Beasley, original composition (Composers/Choreographers Workshop). Performed by Missouri Valley College students. 2003–2001 Member of Common Action, Los Angeles, CA. Performing monthly dance improvisations in public spaces. Dana Hirsch, Artistic Director. June 3: Max10 Performance Lab at The Electric Lodge, Venice, CA. Performing Civilization, choreographed and performed by Sarah Swenson (2002). Text by Halford Frye Meras. June 2: Dance Resource Center's Fieldwork Choreography Concert at Highways Performance Space, Santa Monica, CA. 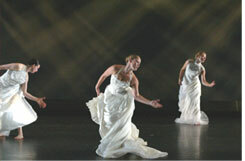 Premiering Civilization, choreographed and performed by Sarah Swenson (2002). Text by Halford Frye Meras. May 11: Orange County High School of the Arts Spring Concert, Long Beach, CA. Premiering Lament in the Cosmos, choreography by Sarah Swenson (2002), music by Arvo Part, Fratres for Cello & Piano. Commissioned and performed by the Classical/Contemporary division of OCHSA. April 9-13: Loyola Marymount University Dance Department, Los Angeles. Guest choreographer. Students of LMU perform Ancestors: Graham, Humphrey, Horton, Taylor, Limon, Ailey & Balanchine. Music by Philip Glass, Symphony No. 3, Movement III. 2002 - 1999: Member of Concrete Steps, Los Angeles, CA. An improvisation collective weekly performing site-responsive dance in Los Angeles neighborhoods. An essay about the work of Concrete Steps by Jeremiah Day appears in the anthology Surface Tension: Problematics of Site. Ken Ehrlich and Brandon LaBelle, eds. Los Angeles, CA: Errant Bodies Press, 2003, pp. 293-298. 2002: Member of Nieces & Nephews, a dance collective performing site-specific improvisational dance and spoken word scores. Los Angeles. November 15-17: Performing The Conversation, choreography by Sarah Swenson, Burnight Center Theatre, Norwalk, CA. Accompanied live by Peter Jacobson, cello. Music composed by Robin Cox, Reflections on Olivet. May 21: Performing dance improvisations with The GerharTabor Percussion Duo, Daniel Recital Hall, Long Beach, CA. Sarah Swenson & Dana Hirsch, Guest Artists. February 23 - March 17: California Repertory Company, Long Beach, CA. Performing as the Princess in Stravinsky’s Histoire du Soldat. Directed by Andre Steger, choreography by Holly Harbinger. November 30, December 1-2: Orange County High School of the Arts Winter Concert, Long Beach, CA. Premiering Ancestors: Graham, Humphrey, Horton, Taylor, Limon, Ailey & Balanchine, choreography by Sarah Swenson (2000). Music by Philip Glass, Symphony No. 3, Movement III. Commissioned and performed by the Classical/Contemporary division of Orange County High School of the Arts. October 25-28: PASTForward: The Influence of the Post-Moderns, The White Oak Dance Project, with Mikhail Baryshnikov, Royce Hall, UCLA, Los Angeles. Community dancer, performing Huddle, choreography by Simone Forti; Exit, choreography by Deborah Hay; and Satisfyin’ Lover, choreography by Steve Paxton. October 6-8: Long Beach Opera at the Getty Center, Los Angeles, CA. Euridice, the opera’s 400th anniversary production. Sarah Swenson, choreographer and movement coach. Directed by Isabel Milenski. June 16-18: Los Angeles Theatre Center, Los Angeles. Performing in Party Scene, choreography by Melinda Ring. April 8, 15, 22, 29: Solo Festival 2000, 2100 Square Feet Theatre, Los Angeles, CA. Performing Solos fromVox Balaenae, choreography by Sarah Swenson (2000), and Nightingale(excerpt from Love Letters), choreography by Della Davidson (1999). February 24-27: Live! Dance & Music, MFA Thesis Concert, Long Beach, CA. Premiering Vox Balaenae. choreography by Sarah Swenson (2000). Music by George Crumb, Vox Balaenae (Voice of the Whale). Performed by students of the California State University/Long Beach Dance Department. Costume design by Liz Pelster, set design and construction by John Nokes. January 18: The Robin Cox Ensemblein Concert at Sushi Visual and Performing Arts Center, San Diego, CA. PerformingPotter's Wheel, choreography by Stephanie Nugent (2000). Original music composed and performed live by Robin Cox. November 11-5, 1999: California State University/Long Beach Dance Department Faculty Concert, Long Beach, CA. Performing Love Letters, choreography by Della Davidson. September 30, October 1-3, 1999: Progress in Works, MFA Thesis Concert, Long Beach, CA. Premiering Blessing, music by Leonard Eto, Lion; and On My Mind, music by Lisa Gerrard & Pieter Bourke, Nils Petter Molvaer, various. Choreography by Sarah Swenson (1999). Costumes by Liz Pelster. Performed by students of the California State University/Long Beach Dance Department. June 1999: Beijing Dance Academy, Beijing, People's Republic of China. Sarah Swenson, Guest Instructor: Repertory workshops, Horton technique. November 13 –17, 1998: CSULB Fall Faculty Concert, Long Beach CA. Sarah Swenson performs the principal role in From My Mother's Side,. Choreography by Jeff Slayton. Original music composed and performed live by Robin Cox. March 13-15, 1998: CSULB Spring Contemporary Dance Concert, Long Beach, CA. Premiering Under the Drum, choreography by Sarah Swenson (1998); poetry and artwork by Turtle Heart (Ojibway), with traditional and contemporary indigenous music. Performed by students of the California State University/Long Beach Dance Department. 1997-1991: Seraphim Dance Theatre, New York City, NY. Sarah Swenson, Associate Artistic Director and founding member. Raymond C. Harris, Artistic Director. Performing throughout New York City, Connecticut, New Jersey. July 1996: Dance Institute of Washington, Washington, D.C., residency. Repertory Coach and Rehearsal Director, choreography workshops, Horton technique. April 12, 1995: First Annual International Student Concert at the Alvin Ailey School, New York City. Premiering Song for a Country, choreography by Sarah Swenson (1995). Music by Lloyd McNeill, Mandela Suite. Performed by students of the Alvin Ailey School (formerly the Alvin Ailey American Dance Center). 1993 & 1992: Chancellor's Model School Project of New York City, Guest teacher & choreographer of We Are The World, an international study project involving cultural dances, music, and UN Declaration of the Rights of the Child. 7th and 8th Grades at P.S. 19, The Asher Levy School, Sponsored by Columbia University and Exxon Corporation. 1991: Artists of Jubilation! Ensemble, company member, NYC, New York. Kevin Jeff, Artistic Director. 1990: Alvin Ailey American Dance Center, Dance Theatre of Harlem School, and Lincoln Center Plaza, New York City. Premiering The Road, choreographed by Sarah Swenson (1990). Music by Lloyd McNeill, Night Voices. Performed by Sarah Swenson and Suleiman Rifai.